What do salsa the condiment and salsa the dance have in common? They're both made better by a margarita. Although I wish I could say that I spent the day dancing the salsa with a handsome man named Javier, I can't. 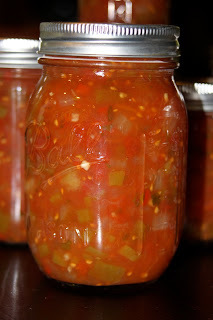 What I can say is that I spent a day canning salsa. As a matter of fact I canned enough salsa to last far longer than any relationship with Javier would. When I say I spent a whole day, I really mean it. It was one of those days where I was in and out a lot, but in between, from 7 in the morning until 8 at night, I was chopping vegetables and boiling jars. 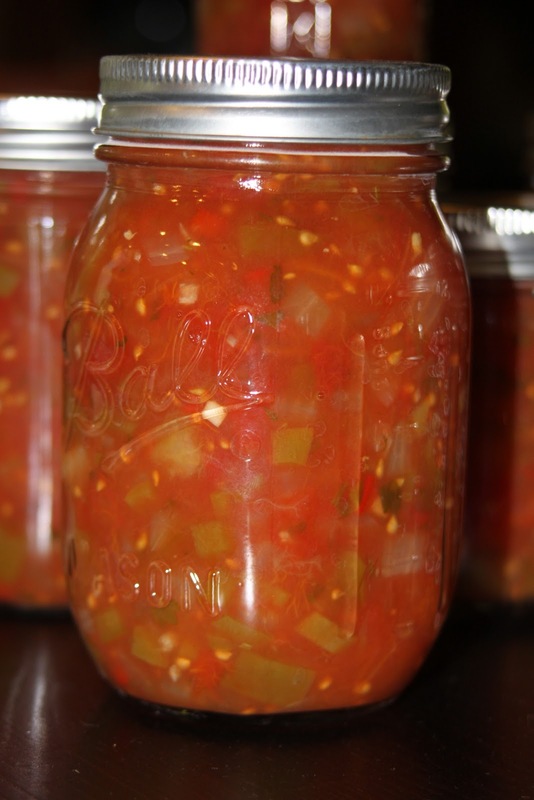 This salsa recipe, that I got from the Ball Complete Book of Home Preserving, is not complicated. It doesn't need crazy ingredients or require unheard of steps. It just makes an enormous batch of salsa, and therefore requires an enormous amount of time chopping. As a matter of fact, when the kids asked what was for dinner, I looked around the kitchen and said, "hmmm...salsa?" There wasn't anything else to be had! Actually, I felt a little bit like a pioneer while making this. Not like Pioneer Woman (she can do anything With élan and verve that I ain't got.). And not like those Mormon pioneers who came across the plains with their 18 children and covered wagons. Goodness knows I couldn't have done it without a drink at the end of one of those days of trekking across the wilderness. I felt rather like the kind of pioneer who "puts up" the veggies at the end of the harvest. The person who had to preserve the food because when the summer ended, there would be no more tomatoes for another 9 months, and the would need it to last through the winter. We only had four tomato plants, but they were prolific this year! Those tomatoes plus the tomatoes I got in the Abundant Harvest box turned out to be more than we could use all at once for a couple of weeks there. And so, the canning. Like I said, this recipe makes a heap of salsa. It used up all the tomatoes that were threatening to fall apart on the kitchen counter, plus some other spare parts slowly dying in the fridge. It does take a ton of chopping, but it makes a ton of salsa. And around here, a ton of salsa is a good thing (balancing out those margaritas and all). In the end, I had 6 pint jars plus 3 8-ounce jars of salsa. Yum. Use whatever type of chili peppers your family prefers, and add hot pepper sauce if your tastes are even more daring. 2. In a large stainless steel saucepan, combine tomatoes, green peppers, onions, chili peppers, vinegar, garlic, cilantro, salt, and hot pepper sauce, if using. Bring to a boil over medium-high heat, stirring constantly. Reduce heat and boil gently, stirring frequently, until slightly thickened, about 10 minutes. 3. Ladle hot salsa into hot jars, leaving 1/2 inch head space. Remove air bubbles and adjust headspace, if necessary, by adding hot salsa Wipe rim. Center lid on jar. Screw band down until resistance is met, then increase until finger-tip tight. 4. Place jars in canner, ensuring they are completely covered with water. Bring to a boil and process both 8-ounce and pint jars for 15 minutes. Remove canner lid. Wait five minutes, then remove jars, cool, and store.